Shure is among the most popular leaders in the audio industry department – coming from the USA, they’ve been stocking up the global marketplace with premium-quality audio gear for 93 years now, and it’s safe to say that they’ve done an amazing job so far. We’ve taken a gander at their assortment of goods, and there’s a very special reason why SM-57 stuck out from the rest. In a nutshell, this is an old microphone model (which was introduced in 1965), but it’s still considered as one of the finest mics ever made. Today we’re going to talk to you about why SM-57 is so good, what should you expect from it, and exactly how valuable it is for the buck. Why is Shure SM-57 so good for vocals? Most people accentuate the fact that SM-57 looks very vintage-like, atop that it boasts a superb level of durability. These attributes appear so very small when compared to how SM-57 sounds like – it’s pretty quiet on its own, which basically means that you’ll get exceptional sound clarity at all times. Even though we could hardly describe it as cheap per se, the SM-57 isn’t too expensive. Generally, people who are looking for a professional level microphone for vocals shouldn’t skip out on Shure’s SM-57. This is an awesome microphone for vocalists, and we’re here to see how it performs through various fields, including sound, durability, design, price, and more. One of the main reasons why Shure’s SM-57 sounds so good is the fact that it features a uniform cardioids pattern that isolates main audio sources while significantly reducing the background noise. What’s more, it’s powerful enough that it doesn’t require phantom power. With the crispy clear performance, this is one of the best boutique level vocal microphones, and it could easily go toe to toe with some of the most expensive audio gear out there. Durability is, perhaps, the field of performance where SM 57 excels the most. It’s one of the sturdiest microphones up to date, as it can withstand all sorts of punishment with ease. “Dropping the mic” gets put into a completely different perspective when this model is in question, as its premium-quality construction ensures years, if not decades of use. On top of that, SM 57 is very, very reliable. Its exterior is tough as turtle’s hide, but the same can be said about its interior wiring and coupling as well. You can rest assured that this microphone won’t fail you onstage. In essence, the SM-57 is a heavy microphone which isn’t necessarily a bad thing. It’s 1.25 inches wide (in diameter) and 5.38 inches long, and it features a cardioids polar pattern. Now, as for aesthetics, most folk would label it as “plain and straightforward”. Generally, one of the most popular debates when it comes to Shure microphones is whether SM 57 or 58 looks better. The head of 57 is small, even barely noticeable, whereas the 58 features a big ball-like head. The fact is that both SM 57 and SM 58 come with an identical set of features (apart from the head), but people who value simplicity and performance should go with the former. 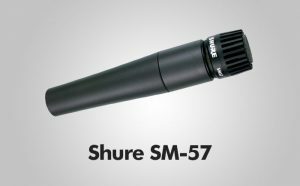 Essentially, Shure’s SM-57 is a microphone best used by vocalists, but it does a tremendous job in the recording sphere as well. Its small head allows it to be placed inside the bass drum and allows for a more flexible approach when placed in front of an amp, but it could serve as a quality overhead microphone with ease. The sheer fact that it boasts an incredibly quiet performance combined with virtually zero ambient noise makes it absolutely ideal for recording. We’ve already mentioned that Shure’s SM-57 is neither too cheap or too expensive. Namely, it belongs to the lower bracket of the “boutique” price point category, and it can be considered as one of those more affordable “expensive” microphones. Its value for the buck is impeccable and huge, though – you’d have a tough time finding a better cardioids microphone in the price range. There are plenty of things that you’ll like about Shure’s SM-57 and but a handful of those you might not like so much. Generally, the pros heavily outweigh the cons here – this is valuable, although not completely faultless microphone which sets the standards for professional use. Pneumatic shock-mount – this mount system reduces the overall handling noise, resulting in even clearer sound performance. Pricey – Shure’s SM 57 – it’s not exactly expensive, but surely isn’t cheap.